Did you hear the news? Evil Dead is officially being redone! I’m kind of excited, mostly because it’s Sam Raimi’s company that’s doing it. I think that’ll get it done right. You’re probably wondering why I started this installment with some movie news, and you’d be right to wonder that. “Has Susan finally lost it?” is what you’re asking. The answer is no, not yet. I know I’m here to talk about horror comics, but I felt that this Evil Dead news was a nice lead in to July being ZOMBIE MONTH!!! Muahahaha!! !Ok, that was more evil genius, but whatever. July is when San Diego Comic-Con happens, and let’s face it. Should a zombie outbreak happen there, the world would be screwed. That’s at least 90% of the people who would know how to survive (the other 10% being the people who didn’t want to deal with SDCC, so they might be the smartest of all of us, even if they’re way less fun). Zombies are a very common tool in horror comics and in the horror genre in general. They represent where we fear the human race is headed. Sometimes it’s a metaphor for consumerism. Other times it’s a fear of technological advances. Either way, no one wants to be turned into a mindless, brainless zombie, so let’s all just keep away from them. You know who knows how to get rid of zombies, or “Deadites” as they’re known in his world, Ashley “Ash” Williams from the Evil Dead series. See? I make sense, just give me time. 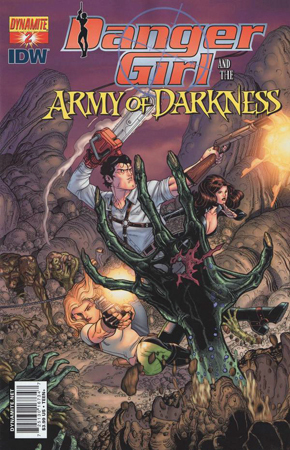 Ash has shown up to fight alongside Danger Girl Abbey Chase in the new series Danger Girl and the Army of Darkness. Basically, Necronomicon Ex Mortis, roughly translated to “Book of the Dead”, has been recovered by the wrong people, again. It’s causing Ash to see deadites everywhere, even when they aren’t there. He punched out a child and postman (and I laughed out loud while reading it) in a very classic Ash way. I like that writer Andy Hartnell is getting the Ash character the way that I classically remember him. I think that’s important when tackling a character as well know and beloved as Ash. It’s only two issues in right now, but I’m curious as to where it’s going to go and who else from the classic “Danger Girl” team is going to show up. So fire up your boomstick and get ready to kill some deadites! I’m liking this trend of taking zombies and putting them into historical situations. You might have seen me mention this a few months back when I talked about 68, a new series about zombies in the Vietnam War. Usually these books involve rewriting past events, but more than that, it’s about tactical and practical use of zombies. Yes, that is an intention that one can have. Zombies don’t really like to adhere to the human’s rules and regulations. When they are used in these historical fiction type comics, they usually come out of nowhere. 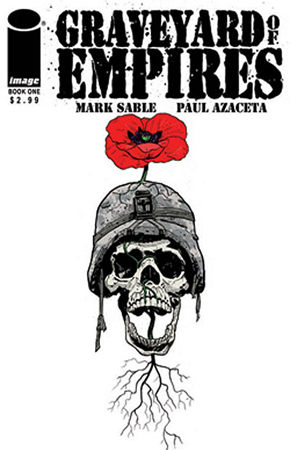 In Mark Sable’s new series, Graveyard of Empires, the zombies are used almost as political awareness. I thought that this was simply a tragedy of war comic before the zombies showed up. Mr. Sable is very good at catching his audience off guard. Of course, now I’ve gone and spoiled it for you, so FORGET! I like when a simple creature, like a zombie, is used creatively by a writer, like Mr. Sable, in order to point out where humanity might have lost its way. Of course, that’s my take on the book. 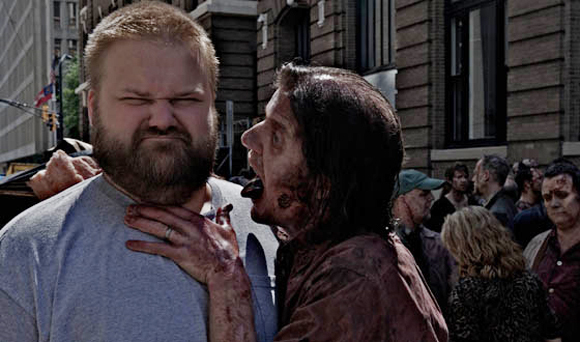 I can’t very well have a zombie article without including Robert Kirkman’s The Walking Dead. I think people who don’t read comics read this book. Not that I blame them, because it’s awesome. I’d say it’s pretty much one of the best things out there right now – not just in horror. Kirkman captures the human element really well, which is why it is now a successful AMC television series of the same name. I don’t even know what else to say about this series except READ IT! If you’re not, then we can never be friends, and I am an awesome friend. I sat down and read nine trades of this series in one sitting – NINE. If that’s not a testament to its level of awesome then I don’t know what is. I missed out on a football game and dinner with friends. Wow. Apparently, I’m bitter about that, and I managed to get off topic. The Walking Dead is a post-zombie apocalypse world where we follow the life of Rick Grimes and the people he loves. He keeps a few. He loses most. It’s pretty much the tragedy we all expect from zombies overrunning the world we know. There is action and heartwarming mushy stuff, so everyone can enjoy it. Just power through the parts that are not for you, because this series is worth it! Oh yeah, and there are zombies. I think I covered a very broad range of zombies and awesome (which really are one and the same). I love working with zombies when I write creatively, because they are so diverse. I love playing and seeing what I can get away with while writing them. I believe that a lot of writers are the same way and that’s why we see zombies in so many different types of stories. We have writers reinventing them into “deadites” and creators who use them to send messages or bring out real human emotions. We can easily see how zombies have made a mark on the entire horror industry from comics to movies and television. Headed down to San Diego next week for Comic-Con? Weird! Me, too! If you want to talk horror with me, shoot an e-mail to susan@comicimpact.com and I will try and meet up with you. I’ll also be cosplaying one of my favorite horror girls, Cassie Hack of Hack/Slash. I’m sure I won’t be the only one, but say hi and introduce yourself. I’m (mostly) not scary. See you there or here next month for more HORROR ON THE 13th!!! Muahahaha! Again, with the evil genius? I really need to stop. Take care and stay scared!